Since I have been a a bit or a roll with wedding topics lately, I figured that I would skip on ahead and cover the oh-so-important topic of marriage registration. This is of particular importance to foreigners due to some extra steps involved. No matter how amazing your wedding ceremony is, your journey to Matrimony Land isn't official until you register it at the city office. Religious and ecumenical ceremonies are not recognized as an official marriage under Japanese civil law. This is a particularly important distinction to make since many wedding halls give out official "wedding certificates" signed by the bride, groom, and family. These have no legal weight what so ever. As avid readers may recall, I recently covered the unique Japanese family registry (koseki 戸籍) system. Although the family register is only available to Japanese nationals, you still have to submit a "notification of marriage" (konin-todoke 婚姻届) regardless of your citizenship in order for your marriage to be recognized domestically. This is true even in the case of two resident foreigners living in Japan. In order to get a proper civil marriage in Japan you must go through the proper legal process and your marriage will be subject to Japanese laws regardless of the nationalities of your spouse or your marital status in your home country. The validity of civil marriage in Japan varies by country, so if you plan to leave Japan make sure to check with the relevant consulate or embassy about the legal standing of you marriage. In the event you are not a Japanese citizen, a "Certificate of Compidence to Marry" (konin yokengubi shomei-sho 婚姻要件具備証明書) signed, translated, and sealed by your home country's embassy or consulate in Japan. This is basically a form the verifies you are legally qualified to marry in your home jurisdiction and that you are currently single. Procedures to get this certificate differ by country so contact your embassy for more info. In the event both partners are foreigners, each partner must submit a separate certificate. 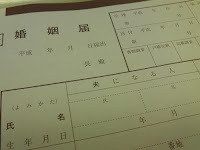 In the event you marry a Japanese citizen, a copy of their full family register (koseki tohon 戸籍謄本) is necessary. If you are a foreigner, your alien card/residence card and passport are necessary. Japanese citizens only need a picture ID. If you are marrying a Japanese citizen, your partner needs to bring an inkan (印鑑) personal seal. This does not need to be a registered inkan (inkan toroku 印鑑登録). Foreigners must sign their name. The personal seals, address info, and family registery info of two witnesses (shomei-sha 証明者). In principle, these two people must be Japanese citizens. There is no restriction on their relation to you so parents work just as well as close friends or relatives. It is a good idea to consult with someone at your local city office in order to make sure your forms are all in order since authorities tend to be very exacting when it comes to making sure your paperwork is proper. Since foreigners cannot get a family register, your spouses name will not automatically be changed. If your partner wishes to take a foreign name last name they have to fill out a separate form called gaikokujin to no konin ni yori namae henko todoke (外国人との婚姻による名前変更届). This must be done within six month of a marriage or else your spouse will keep their original Japanese name. If you are foreigner wishing to take a Japanese last name, you will need to consulate your home country's authorities as the the appropriate procedures. Also, remember that filling out a notification of marriage does not automatically change you or your spouse's address. In order to do this, you must first do change your address registry. This is often done at the same time your submit your marriage credentials. After you complete your marriage, you or your spounce can legally file for taxes and social services as a dependent (fuyo 扶養) provided their income is below a given threshold (usually about 1,300,000 to 1,600,000 yen in yearly income). There doesn't seem to be any clear answer as to when it is socially acceptable to submit your marriage notification certificate. This ritual known as nyuseki (入籍), or literally "entering the family register" and it will also mark your "official" legal marriage. For this reason, some couples opt to submit their certificates on their wedding day while. However, I know people who get legally married several months in advance of their wedding or several months after. Since the day of your marriage is forever recorded in you family register, many couples opt for special auspicious dates or easy to remember aniversery dates. Also, some localities allow of your to submit your notification of marriage on weekend or even drop it off at night. If you are looking for a special date or time then make sure to talk to your local city hall to see what their policies are. Is there any way to find out what Japanese city a marriage has been resgistered in if this infomration has been lost? I would expect that your official residence records would contain a note of that; have you already tried asking at the town or city hall which currently maintains your residence records? I am looking at getting married with my Fiance here in Japan. I have all the paperwork including the certificate of no impediment, translated into Japanese. Do I need to have my passport translated into Japanese aswell? Good evening Iam married in Japanese for 9yrs and have legally entered his kosekitohon.,is that the proof of marriage here in japan(kosekitohon)? how can i get marriage certificate in Japanese Embassy?